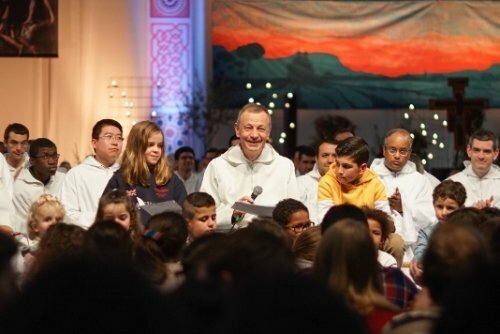 In Madrid, where the 41st annual European meeting hosted by the community of Taizé gathered 15,000 young people from across the continent, the Prior of Taizé, Brother Alois, announced that the next European youth meeting will take place in Poland, in the city of Wrocław, from December 28, 2019 to January 1, 2020. The Primate of Poland, Mgr. Wojciech Polak, Archbishop of Gniezno, and the auxiliary bishop of Wrocław, Mgr. Andrzej Siemieniewski, made a special trip to Madrid to be present for the announcement. At a time when the construction of Europe is encountering great resistance and when misunderstandings between countries have been increasing, a meeting in Poland will give thousands of young people the experience that mutual trust can be built. This will be the third time that this gathering of European Christian youth of all faiths will take place in Wrocław (after 1989 and 1995) and the fifth time in Poland (after Warsaw 1999 and Poznań 2009). In announcing this meeting, the Taizé Community is responding to an invitation sent to it from Wrocław simultaneously by Catholic Archbishop Kupny, Lutheran Bishop Bogusz and the mayor of the city. These annual European meetings are part of a “pilgrimage of trust on earth” led by Taizé for over forty years. The young adults who participate in these gatherings gather to pray together, to be part of a local church for a few days, and to explore themes such as understanding among peoples, peace, questions of faith, and social commitment. One of the objectives is to enable young people to have an experience of the Church as a place of friendship, welcome and communion. Jesus said: Just as the living Father sent me and I live because of the Father, so the one who feeds on me will live because of me.